Western Whiskey Gazette (WWG): Barkeep... this whisky's for the birds! Out with the old and in with the new. A term that certainly applies in a lot of cases. Such though, was not the case with a lot of our pioneer liquor wholesalers. Actually, "if it aint broke, don't fix it" is probably a little closer to home. Take Naber, Alfs and Brune for instance. Established in either late 1879 or early 1880, the firm was originally located at 413 Front Street in "The City" (San Francisco). Naber, Alfs and Brune became one of the major liquor wholesalers supplying the west. 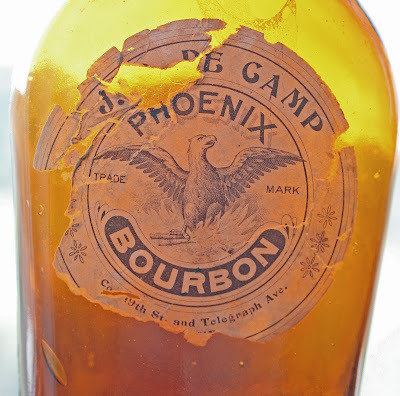 Their most popular brands were Phoenix Bourbon and Damiana Bitters, but they also sold Club House Bourbon, Gold Medal Bourbon, Union Club Bourbon, Rock and Rye, Rum Punch Extract and Blackberry Brandy. 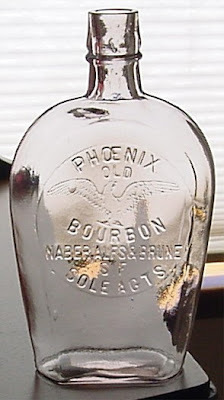 The Phoenix name proved so popular that Naber, Alfs and Brune maintained it as their flagship brand until prohibition. Rather than reinventing the wheel they continued to use the same full face mold when the transition from applied tops to hand tooling of the lips occurred. A bulge neck variant, both with and without a picture of the Phoenix embossed in the glass, was also used during the transitional period from glop to tool tops. Although originally thought to contain either scotch or rye whiskey, a still corked bulge neck example was recovered some time ago from a barn with full contents and bearing the original label for... Damiana Bitters. brand, instead of just being Sole Agents for it, a new mold was cut. 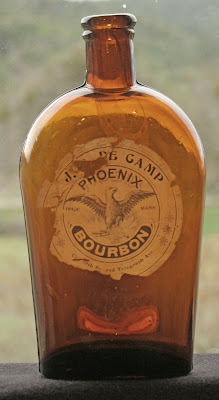 This tool top bottle has a large bird facing right and is embossed Phoenix Bourbon. And the theme of the Phoenix is further reinforced on these later molds with the graphics of the flames and ashes beneath the bird. It was blown into a four piece mold and the embossing on the early ones is so crisp that you can almost smell the smoke from the ashes that the Phoenix is rising out of. 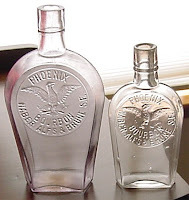 Later still, a couple of two piece mold bottles were made with a large bird facing right; one embossed Phoenix Bourbon, the other Phoenix Whiskey. Notice the spelling of Whiskey, as opposed to Whisky; evidence that the product was now being distilled and rectified in San Francisco instead of Kentucky. All of the above variants are attributed to the ca. 1890 - 1900 era and were blown in shades of amber. By now, the company had relocated to 323-325 Market, where they would remain until burned out in the Great Earthquake and Fire of 1906. A small run of the two piece mold, large bird facing right was blown in clear glass that will turn purple. They are seldom seen and extremely desirable. A small bird facing left was also blown in a two piece mold. Although originally thought to date from the same era, the bottle appears to be more neatly made and may well date past the turn of the century. In as much as none of the tool tops have base markings that can be attributed to a specific glass house, we may never know exactly what the dates of use were though. A number of embossed clear and amber tooled flasks were also produced ranging in capacity from 1/2 pint to one full pint. They too prominently displayed a large Phoenix in the center of the embossing pattern. An exceptionally rare pre-prohibition shot glass was also produced in this era. It served as top of the mind advertising with every shot of Phoenix Bourbon that slid across the polished mahogany bars of saloons throughout the old west. 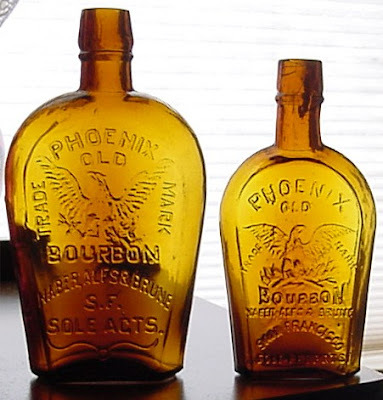 Local saloons purchased Phoenix whiskey in bulk and bottled the product in unembossed flasks with private labels. The mortality rate of labels is exceedingly high and as a result, are seldom seen. As mentioned earlier, Naber, Alfs and Brune also marketed Damiana Bitters. 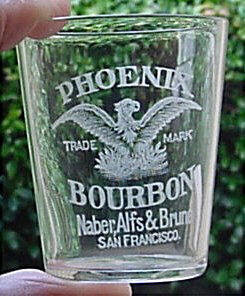 The label plainly displays the trademark Phoenix (which now looks more like an eagle - which is perched on a cactus?) while boasting that they were Sole Manufacturers and Proprietors. In 1907 the firm rebuilt at 825 Mission and remained there until 1910 when they relocated for the last time to 631-635 Howard St. Around 1910 the firm also commisioned the production of their final bottle, an amber quart "tanker" embossed Full Quart (on the shoulder) Naber, Alfs and Brune / San Francisco, Ca. (on the obverse face of the bottle). Although it supposedly was used only until 1917, odds are that it's use continued until passage of the Vostead Act and the ratification of the 18th Ammendment to the Consititution. Their doors were closed forever on January 16, 1920 and the firm of Naber, Alfs and Brune silently slipped into the pages of history. Depending on who you believe, the amber Phoenix pints and half pints date from the late 80's to the late 90's. Thomas attributes the pints ca. 1888 - 1895 and the half pints ca. 1895 - 1899. Not sure how he came up with the dating as the examples that I've inspected over time all appear to have been blown using nearly identical manufacturing techniques. Neither show any definitive evidence of being older than the other. A lot of times you can compare dates of bottle that came out of the same depth while digging. I've never dug one so have no age strata cross section to compare with. So let's just suffice to say, late 80's to turn of the century. Maybe some of the luckier diggers out there can weigh in on this one?